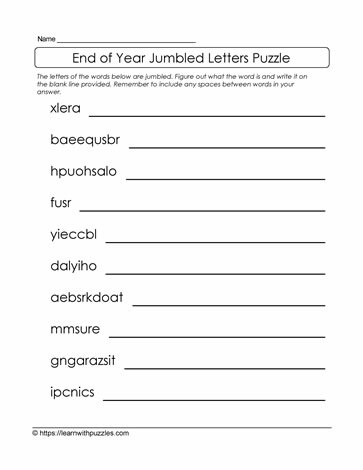 This jumbled letters puzzle for the end of the school year is sure to engage kids brains as they word toward unscrambling the letters to create words related to end of school year. To solve the puzzle start by brainstorming ideas about words related to the end of the school year. Next, find words with the least number of letters in the question and then unscramble them. Then, continue unscrambling letters using knowledge of letter patterns and word patterns, remembering to leave spaces between words when needed.